It is a kit removing AIS (air induction system) attached to the SR of the emission control car. I control outbreak of unpleasant after fire such as at the time of engine braking. A plate and a rubber cap blocking up the hole after the second intake device disassembly are set kits. ※The car inspection that I put on becomes incompatible. ※The FI car becomes impossible of wearing. ・I take off a side cover. ・I remove a pipe on the cylinder side of the AIS (air induction system) and a hose on the manifold side. 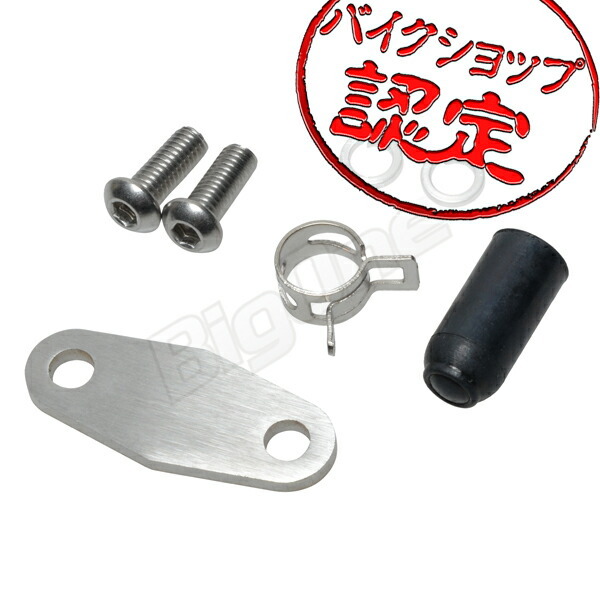 ・I put on a plate with a bolt and a washer in the point (the engine side) that took off a pipe. ・I attach a rubber cap to the point (the manifold side) that removed a hose and fix it by a clip. ※By disassembly of the AIS, the setting change of the carburetor may be necessary. Please set it in conformity to a vehicle. When I am attached in you, and malfunction occurs, the guarantee is not intended under any circumstance.